A designer should know that an object can become tool of an existential rite. She studies Architecture at the Ecole Nationale Superieure d’Architecture de Lyon and at Politecnico di Torino, where she graduates in 2010. 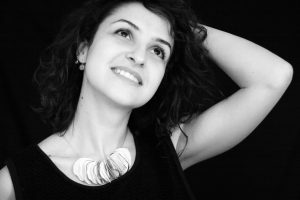 She works as architect since 2009 between Turin and Milan and, in 2015, she combines architecture and design focusing on handmade porcelain, exploring the sculptural features of clay to shape ‘living’ caramics with strong organic and abstract references. She discoveres an immediate feeling with this wonderful material and she learnes to work the porcelain as self-taught, supported by some italian and dutch masters. In this way, almost accidentally, begins BIANCODICHINA: a contemporary ceramic brand inspired by the memory of landscapes and by the feeling about its. Creativity guides the work and the porcelain, just like a living organism, opens up, grows, develops and takes up space. This research leaves colours a marginal role, preferring organic glazes, pigments and oxides. Bisque porcelain prevails and its silky texture recalls a shell or a fossil, associating every piece to the organic world which is its source of inspiration. She doesn’t follow a definitive project: the hands just follow the flow of creativity and the result appears only at the end. This is the reason why every peace is unique and different: a family made of one-off pieces depicting a fantastic domestic landscape.